All transactions are safe and secure with a reliable history in online purchasing behind each of our associates. 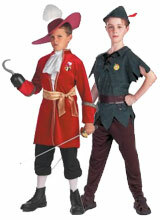 Buy the Peter Pan and Captain Hook Costumes to own Peter Pan clothing and merchandise. If Peter Pan shirts aren't enough to make you feel like you can fly, then turn your attention to our Disney Peter Pan costumes. Not only is he the object of Wendy Darling's affection, he is also a bona fide hero. For anyone who likes to dress up as more sinister characters, check out the Captain Hook costumes. Not only has Hook made it his life's goal to kill Peter, he also stole the Indian Princess Tiger Lily and tried to drown her. If you are looking for a more girlie outfit, check out the variety of fairy Disney Tinkerbell costumes for babies, girls and adult women that we feature below. In addition to the Peter Pan and Captain Hook Costumes above, browse the Peter Pan Clothing Gallery for more apparel like men's and women's clothes, kids shirts or hoodies.